It was a rather ordinary day at the office yesterday when I got a very spontaneous and very special invite to watch the Linkin Park concert last night at the SM Mall of Asia Arena. I didn’t think twice about it. It was like bumping into a college crush you haven’t seen in almost a decade and you really just couldn’t help but grab the chance to at least say hello. It was just like that. Well, actually, it was exactly that. I actually shrieked upon getting the invite from a good friend and ex-colleague to watch the concert with them. Chester and Mike were my kind of rockstars when I was in college. I used to know their songs by heart! Their songs were poems to my ears. I know, I know. I don’t look like it. And I’m pretty sure I would have a hard time convincing post-college friends about this fact. But, heck, my speech for an English Communication class was about music and I even used some lines from Eminem’s Kill You as an introduction. I sure did get my classmates’ attention with that. But I digress. Back to Linkin Park. The songs suddenly came back to me as I crafted a plausible plan to get to the MOA Complex during the rush hour. And I was thankful I decided to wear black that morning. I couldn’t be more concert-ready! During the front act’s performance, we hunted the second floor of the Arena for food. Ang cold burgers (na kasing-cold ni Ate na nag-serve) ay kulang. We were still hungry. And we really don’t know any song by Urbandub. 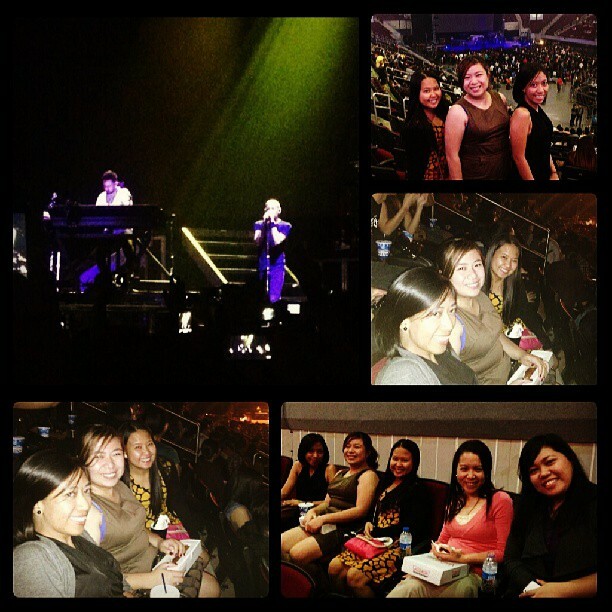 A few minutes before the show started, they let people from the upper boxes and general admission to the lower boxes. Seeing the commotion, we too inched our way down to the better seats. And the most amazing rock concert I’ve been to so far started! We screamed to their songs (at least to the ones we know by heart); we banged our heads to the music (but tried to maintain a lady’s composure, of course); we raised our hands and sway (whenever Mike or Chester wanted us to do so); we stomped our feet (when our hands got tired clapping); we made noise (because that’s what you’re supposed to do when watching Linkin Park); we danced (when we didn’t know the song anymore); we sat down (to catch some air); we rose from our seats to scream, sing our hearts out, bang our heads, stomped our feet and dance some more; and most importantly, we enjoyed our time rocking with the band! A rockin’ girls nightout, it indeed was! Couldn’t thank Yani and her sisters enough for the unforgettable time. It was an exhilarating show. The first time they were here, I was a freshie in UP Baguio and wished to see them play live. 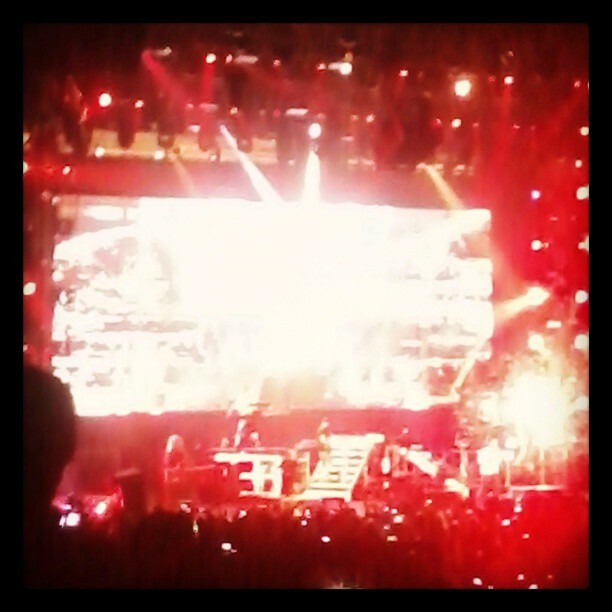 The concert was in Manila. But I was friends with one of the organizers. He called me up to let me hear them sing. That was the nearest I got to my wish, until last night! Here’s the setlist, by the way. I stumbled upon this while looking for the song na parang hinaharana lang kami, ayon nga kay Benj. It was a wonderful feeling to realize that even forgotten dreams do come true. And when Universe surprises you with one of them, there’s really not much to do but take it in and just be grateful. A lesson I got from this: Never ever let go of your dreams, however big or small they are. Sometimes you have to work hard to reach these dreams; but there are times one is just thrown your way because perhaps you’ve somehow done something good and the Universe thinks you deserve it. | Thanks for that wonderful surprise, Universe. Rock on! This entry was posted in Me, Myself and Arl, Up a Notch, You Might Wanna See This Too and tagged Linkin Park, Linkin Park Manila 2013, SM MOA Arena. Bookmark the permalink.